Samsung has worked up a new naming scheme for its Androids and today we’re seeing the first phones to abide by the new rules. Of course, old models fit the new naming scheme too, but what Samsung has done is codified the tiers (low, mid, high, premium, and “Super Smart”). I’ll go over the four new models from Samsung (which hail from the M, W and Y lines) along with a few older ones (that conform to the new naming scheme) to see how well it works. You’re welcome to join me. First, here’s how the new naming scheme works – Samsung’s Android phones will carry the Galaxy name and will be put into one of five categories signified by a letter. A few special suffixes will denote special features too. Let’s take a look the new Samsung Galaxy W – it’s a W phone so, it’s relatively high up on the ladder and focuses on looks and performance. Basically, it’s a mid-tier device (3.7″ WVGA TFT, 1.4GHz CPU, 5MP camera) and goes for clean, sleek look. So far, so good. Let’s look at another model from a couple of months ago – the I9103 Galaxy R. It goes for a dual-core 1GHz CPU and packs a 4.2″ SC-LCD screen. The R line offers premium devices, so you can expect things like this – good alternatives to the S line for non-powerusers. 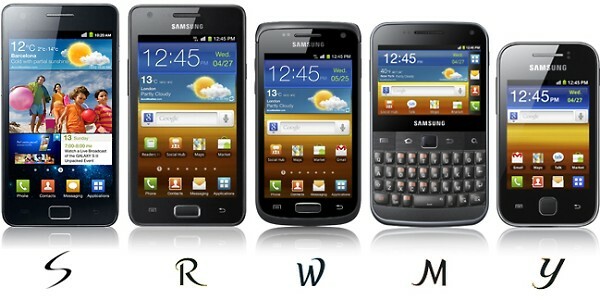 The Galaxy S line is well known and continues to carry Samsung’s flagship droid. I have a feeling there will be only one or two phones in this class at any given time – so, you get the latest Galaxy S and what you’ll have is the best Samsung has to offer. There’s nothing new here really, just the Galaxy S II. Of course, part of navigation the gadget world is getting the most bang for your buck. The Galaxy M Pro B7800 offers a 1GHz CPU, 5MP camera and a relatively high-ppi screen. It’s part of the performance on a budget M series. The “Pro” tag has so far traditionally stood for a phone with a physical QWERTY and sure enough the Galaxy M Pro has one. I mentioned the S line, some might have thought I forgot about the I9001 Galaxy S Plus – I haven’t. The Plus suffix means that Samsung has taken an old design and have bumped up a small subset of its features, in this case the CPU (from 1GHz to 1.4GHz). The Galaxy S Plus is not actually a flagship model. In the future, we might see Plus models with better cameras, or screens or another upgrade. There’s a third suffix – LTE – which obviously indicates 4G LTE connectivity. This is great since all the carriers started tagging on “4G” to phones that didn’t actually have 4G – the new system makes it much clearer. There aren’t any LTE models yet, at least not ones that officially carry the suffix. I got side-tracked by these suffixes and almost forgot about the Galaxy Y S5360 and Galaxy Y Pro B5510. Those are entry-level devices (the second model obviously comes with a keyboard) and target youths, which is pretty much what the Y series is about. Okay, now you should be able to guess pretty accurately the specs of any new Samsungs that come out. You’ll get a chance to practice during IFA (starts September 2nd) when Samsung will show off these and hopefully some other models.